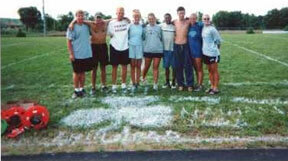 Kevin "Trackstar" Wick, a Pioneer soprano in 2000 and 2002 (he was horn sergeant in 2002), submitted this one: "This is a picture of the 2002 Pioneer field lining crew after we painted our last field before finals. It was our tradition to mark each field with a shamrock and to finish off our last early morning together we all signed our names to the grass around it. We spent many a long hour together as we marked up to three full fields day, and even though we were in separate sections, we all learned to get along pretty well near the end of the year. Left to right is Tyler (drum major), me, Gilley (snare), Erin (cymbals, lows/tri-toms), Jessie (mellophone), Nathan (soprano), Dallas (bass), Tanya (guard) and Emily (drum major)." Thanks Kevin! E-mail your Forzato submissions to dave@dci.org along with where and when the photo was taken, and send some biographical information about yourself as well. We'll give you full credit. Also, let us know if you want your e-mail address included, to get feedback from other drum corps fans.